Just like our other Mcstolly Mixes, but with allll rhinestones and not round silver or brass spots, this collar is...GENIUS. Being this is a random spotted collar, the pattern will vary making each collar an individual, just like your dog. 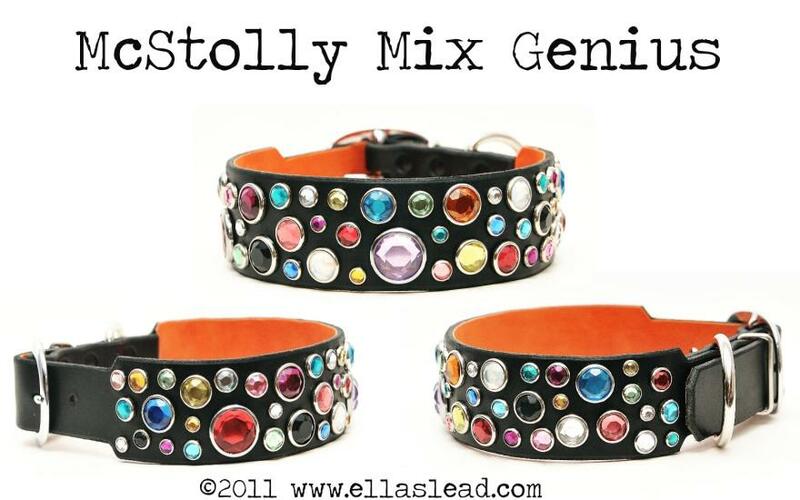 The only thing we can guarantee is there will be a multitude of colored rhinestones, in three different sizes, allowing your dog to always wear a one-of-a-kind collar. YAY! This collar will be available in our black, cognac, pink, burgundy, red, pumpkin, chocolate and white leathers. It's your choice. The suede lining color is also up to you. It will be available in the following widths: 1", 1 1/4", 1 1/2", 1 3/4", and 2" (2" will be tapered down to a 1 1/2").